LAHAINA - With a $6,600 grant from the North Beach West Maui Benefit Fund (NBWMBF), the curriculum at Holy Innocents Preschool (HIPS) in Lahaina is a medley of diversity. Cynthia Shibao, director of the preschool on Front Street, is grateful for the addition of the Hawaiian Cultural Program. "I would like to give a big mahalo to the NBWMBF for giving our school the opportunity to expand our Hawaiian curriculum - to offer hula every week and all year long, allow my teachers to have the proper training and funds for supplies and field trips," she said. "We are a nonprofit and on a tight budget as it is," Shibao continued, "... and to perpetuate the Hawaiian culture is priceless! We definitely would not be able to offer as much as we do without this grant. The children have the opportunity to learn Hawaiiana hands on, and they really enjoy it." Highly recognized Kumu Hulu K. (Kathy) Holoaumoku Ralar is an integral element of the cultural experience for the keiki at the nationally accredited (National Association for the Education of Young Children) West Side preschool. Ralar is kumu hula of Na Pua O Kapi'olani Hula Studio and Napili Kai Foundation. The children, ranging in age from three to five years, enjoy her twice weekly classes, including song and dance and lessons about hula implements, Native Hawaiian instruments, plants, food and games. Na keiki are enthusiastic when Kumu Kathy shares. "I like doing the different dances (hula). I like singing with Kumu Kathy," Tera'itea Branco-Gomes said. Haumana (student) Travis Utrillo was an equally eager learner: "I love hula, because I love Nui-Nui Coconut Island Tree." That's not all; there's another aspect that is likewise important to the overall success of the program. "We have teacher workshops with Kumu Liko Rogers throughout the year. He helps the teachers create Hawaiian lesson plans. 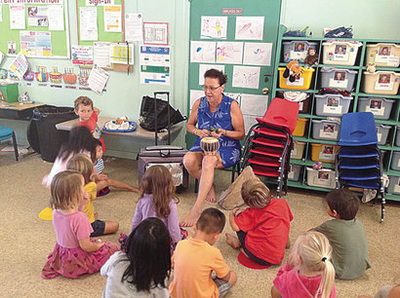 This curriculum includes songs (meles) and oli (chants) for circle time, ukulele training and Hawaiian games," the director of the preschool observed. Utilizing Kumu Liko's talents and multiple years of experience as an early childhood and Hawaiian Immersion teacher at Princess Nahi'ena- 'ena is beneficial. "The teachers are able to use what they learned in the workshops and put it in their curriculum," Shibao explained. "They set up their classrooms using natural Hawaiian materials (teachers learn to collect ali'ipoe seeds for an activity). They taught meles (songs) and Hawaiian hand games. They taught about the wa'a (canoe) and then how the Hawaiians used tides/stars/ weather to sail. They taught about native plants and animals (birds, sea life)." Teachers at HIPS are Katherine-Ann (Saiki) Bumanglag, Meghan (Palakiko) Ramos and Charmane (Ms. Ai) Yamada. Another part of the HIPS cultural learning experience, the Lahaina News learned, is the once-a-year field trip that the grant funds provide. In 2016, HIPS went on a field trip to the Kaanapali Beach Hotel (KBH). "Dee Coyle (director of training) and the KBH staff (Iokepa Nae'ole and Paige Currimao) from the Hale Huaka'i were very accommodating and shared so much of their mana'o," Shibao said. "They had so many different activities. (We) learned about their special wa'a (Ka'ilila'au); learned about different Hawaiian implements - fishing, hula, music. They got to throw net and learned a hula; and, at the end, they did plant and flower printing and got to take home their art project. KBH was so wonderful, and everyone learned so much." The grant writer is Kit Harris. A Kahana resident, Harris is a retired (2013) special education preschool teacher at King Kamehameha III Elementary School, where she taught for 23 years. "This is the end of our second grant year," Harris noted. "Every year, we have to reapply for a grant," she explained, adding, "we hope to perpetuate this program and will be applying for another grant for the 2016-2017 school year." 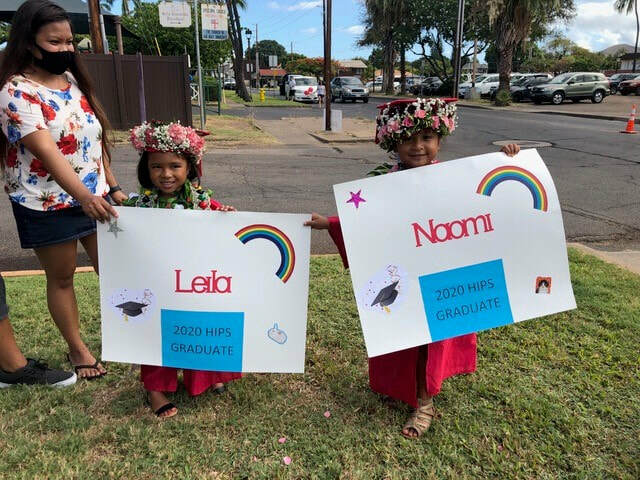 Ms. Ai commented, "We are grateful for the support of the NBWMBF and our kumu for providing the keiki of Holy Innocents Preschool with the important foundational learning experiences that will keep our keiki grounded in who they are and where they are from." For more information about the NBWMBF, visitwww.northbeachmaui.org/.